When we were looking for a new office our Founding Director Claire Hopkins said “Aside from simply finding a larger space, I wanted to be sure that our new building would support the way we work at Ideal.” Two years on we can be certain that the new office has achieved just that. 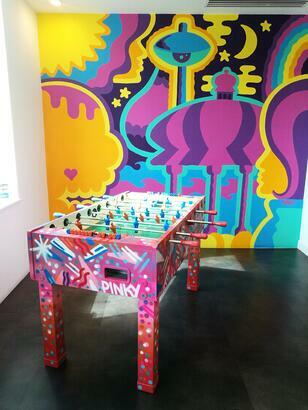 The communal area with our brilliant mural painted by local artist Pinky creates a space for us to build relationships with colleagues and guests in colourful and comfortable environment. This bright, open space is used by staff to enjoy lunch, congregate for Friday drinks, social events and to play foosball, table tennis or one of the many other activities. We also use the space to keep each other up-to-date with the latest news and events via our internal screen. In additional to the communal area we also have break-out spaces to facilitate collaborative and cross-departmental working, something that has evolved as we have grown. The larger we get, the more these spaces are in demand which is really positive as it reflects our relationship value. Since we have moved into our offices at City View our ambition is in full swing and we have grown staff numbers by around 30% and there is loads more room for new talent and ideas. Lots of our guests often comment on the lovely bright, open space and the welcoming feel of the office. Feel free to pop in and talk to our experts in networks, security, collaboration and platforms and understand how we can work together to create value, protect and accelerate your business. Contact us here.